It's a new lowest maximum record, and the third time in a row that extent stayed below the 14 million km2 mark. The previous lowest max on record was reached in 2015 (13.942 million km2), almost beaten last year (13.959 million km2), but this year SIE went lower still and peaked at 13.878 million km2. The drops are mostly driven by sea ice reductions in the Bering and Okhotsk Seas, but will soon be joined by drops on the Atlantic side of the Arctic as well, as the ice is pretty thin there, according to the Uni Bremen SMOS thin sea ice map. It's that time of year when the melting season is drawing to a close and the Arctic sea ice pack is reaching its lowest size of the year, also known as the minimum. This melting season was a strange one. After the mildest winter on record, a spectacular opening up of the Beaufort and Chukchi Seas made trend lines on graphs go extremely low even before the melting season had properly started. But then clouds moved in during the period when the Sun is at its peak, and solar radiation causes melt ponds to form on the ice pack, building up so-called melting momentum. June and July were really cloudy, as cloudy as in rebound years 2013 and 2014, but this time around atmospheric conditions weren't accompanied by low temperatures on the ground and in the water. The warm winter, early opening up of the ice pack and the rapid melting of land snow cover, caused another kind of momentum, one of heat, that kept the melting going throughout. And then in August, a massive storm that kept on re-intensifying (or maybe they were two separate storms), followed by a Dipole with a massive pressure gradient, battered the ice pack. Again, as in 2012, we've witnessed the detachment of one large piece of ice from the main pack. And now the 2016 melting season has reached 2nd place on almost all extent and area graphs out there. You read it right, a melting season that saw mostly cloudy conditions during the sunniest period of the year (June-July-August) has beaten the 2007 melting season which went astonishingly low after weeks of ceaseless sunshine and a massive Beaufort Gyre, continuously compacting the ice pack, well into September. But it looks rather unlikely that the 2016 melting season will end that late. The past few weeks have promoted massive ice dispersal, with large zones of low concentration near the Pole, and so there's a lot of compaction potential. But for compaction to happen, winds need to blow towards Greenland and the Canadian Arctic Archipelago, or else freezing temperatures start to dominate and all that open water within the ice pack and on its fringes starts to fill up with ice. The reverse is the case. The remnants of the now fully detached Wrangel Arm are still melting, compensating the ice growth elsewhere, but I'm pretty sure the minimum has been reached. I will have a blog post with more images characterizing this melting season up later this week. Weather conditions in the past month - the (Great?) Arctic Cyclone followed by the Mega-Dipole to be precise - have left a mark on volume decrease. During August 2016 more sea ice volume was lost than during any other August in the past decade, with the exception of 2008, even more than during August 2012 (2909 km3 vs 2744 km3). Just like on the area and extent graphs, 2016 is almost in second position here too, as the difference with 2011 shrunk from 621 km3 to 84 km3. There is a lot of melting potential in the East Siberian Sea region, extending into the Central Arctic, that could make this year end up close to the 2011 minimum, which is second lowest after the 2012 record lowest minimum. There hasn't been a marked effect on the ice as of yet. 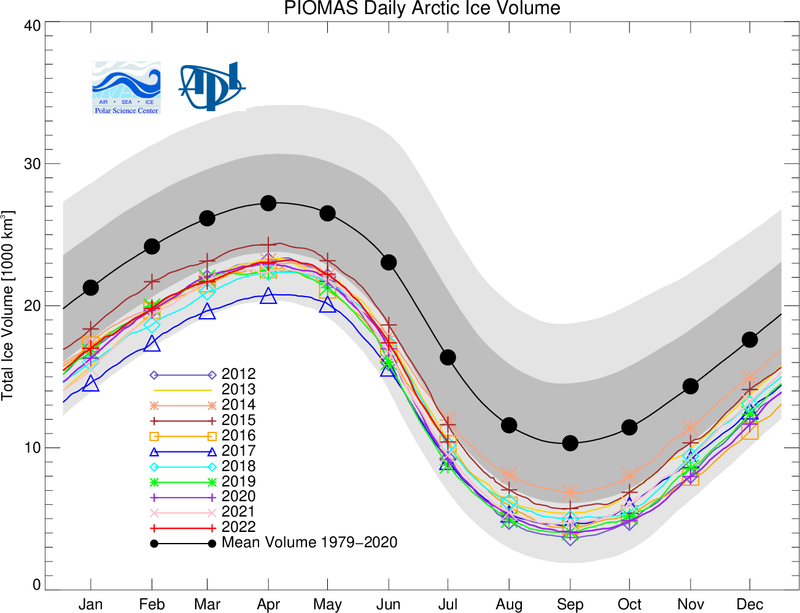 On the Forum Wipneus reports a large drop of 170K in the Cryosphere Today sea ice area numbers he calculates. This is the third largest August daily drop in the last decade, but Wipneus explains it is partly due to flash melting in the Canadian Arctic Archipelago. A large drop in NSIDC SIE numbers of 122K is entirely due to the CAA, but it would be even larger if it weren't for ice in the Laptev Sea 'unflashing' into the view of the SSMIS satellite sensor aboard the DSMP F18 satellite. If it now somehow manages to end the month between 2011 and 2015, there's still room for August weather to keep the race exciting. The 2016 trend line managed to end July right between 2011 and 2015, it is still in 3rd position as we speak, and now August weather is going to keep the race exciting. Another big cyclone is on its way and will hit the ice pack the day after tomorrow (no pun intended). This storm will not be as intense as the Great Arctic Cyclone of 2012, but it will be almost as big, and linger for a few days. I think it's the second biggest storm I have seen since starting this blog, back in 2010. It's difficult to tell whether this storm will have as much of an effect as GAC-2012 had. The ice pack was much weaker back then due to plenty of periods that were conducive to melting, in other words melting momentum. There hasn't been much melting momentum to speak of this year, as there has been little preconditioning of the ice pack during May and June, and cloudy conditions kept dominating the Arctic up till last week. When the Great Arctic Cyclone hit in 2012 all of the weak ice in this zone detached from the main pack and was annihilated. We'll have to wait and see if something similar can happen this time around.